Customers are important for every action in CellSmart POS. Buying, Selling, taking payments, creating repairs, creating layaways all require customers.You have the option of creating customers on every transaction but you are not required to. If you do not create a customer, the software will indicate it as a walk-in customer. Then click on the Customer icon. You can create a keytag through the Customer's window. Keytag is an ID that can be assigned to one or more customers. 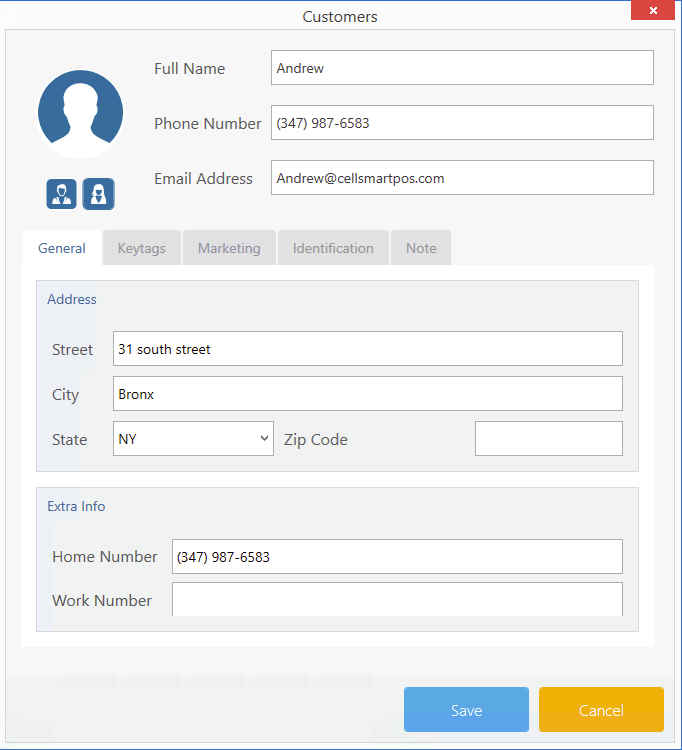 This removes the need for the customer to remember their phone number or the phone number of family members or friends they may be paying for. If you enter a keytag that has not been assigned you will have the option to add it to a customer. You may also add a keytag by editing the customer. Payment messages: Payment messages can be sent to the customers when turned on to notify them that the bill payment has been made. Bill Reminder: Bill reminder sends customers a reminder when turned on that their bill is due before a certain date. This allows your customers to stay on top of their bill payments. Promotion: Increase your sales and allow repeat business using promotional messages. You can send promotional messages to your customers notifying them about sales in your store and increase your business. Each promotion will cost you $0.2 cents per customer. You are able to send promotions both in English and Spanish. NOTE: These options are turned on by default when creating a new customer. You can turn them off by going into the marketing tab. You can enter more information about your customer through the ID tab. You can enter their state ID, SSN, DOB and more. This will allow you to easily search your customers in the software. Clicking on the Customer icon. Searching for the customer by entering their name in the search field. Selecting the customer and clicking on the view button. You can enter customer details in the notes tab while creating/editing a customer. These notes will not be printed on any receipt and will not be visible to the customer. Upload an image of your customer through the image tab by selecting an image from your computer. This will help you remember your customers!